Now you can easily manage your Bible readings, plan, prayers, etc easily. You just need to get the Daily Bible and Prayer 2.1.1. It provides you to with Bible reading plans, prayer tracker, and daily devotional features that make it easy for you to keep track of the read parts and even maintain the new prayers. You can manage the record of the activities well and make a check anytime you want. The features provided by the program are easy and can be utilized by any normal user. You are also provided motivational messages that are shown daily throughout the year. Daily Bible and Prayer 2.1.1 is a great source encouragement for religious enlightenment. 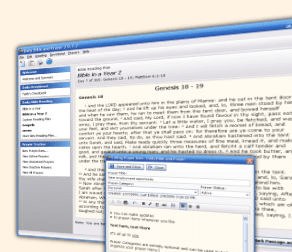 The interface of Daily Bible and Prayer 2.1.1 is not very complex any user can easily operate it. It provides you with different options that can be used accordingly to your choices. The Bible reading plan features helps you to get through the Bible by any of the two methods that are given with the program. With it, you also get the choice to create your own schedules for reading that can include preference, amount of time and scriptures. The software is also capable of tracking the progress that you had made and thus helps you to cope up, if you lag behind. For the daily Devotional messages, you just need to click on the Faith`s Checkbook that is provided to you through the task list and Devotional menu. The devotional message for the day would be displayed and you can even check for the devotional for all the days of the year. With the Prayer Tracker feature, you can have the list prepared for your prayer and have them well organized. You can the answered prayers moved to separate list. Daily Bible and Prayer 2.1.1 is capable of helping you to deal with the prayers and Bible reading in an effortless manner. Rated with 3.5 points the software is comfortable to work with and helps you to keep proper track of things that support your endeavor.